The listener seeking sixteenth-century church music at its best is likely to turn to settings of the ordinary of the Mass. This may in part be the consequence of the post-symphonic assumption that a Mass lasting half an hour is somehow more significant than a three-minute motet. But for the composer of the time too, the Mass was an important medium: often one in which he could display his skill on a large scale, honour a particular occasion or person (a saint or a patron), and sometimes pay homage to a fellow composer by choosing in friendly emulation to model his work on his themes. But as the century ended, the Mass became less important musically. One reason was the greater respect given to the meaning of the Mass. The Reformation’s arguments on the nature of the Mass, and the Catholic church’s reaction exemplified in the Council of Trent, diminished its use as an occasion for ostentatious display. It is significant that there are no complete Masses by Giovanni Gabrieli, who was writing for the church most famous for the musical elaboration of its ceremony, St Mark’s, Venice. The fundamental changes of musical style in this period took place apart from music for the Mass. Sixteenth-century composers published books of masses and motets, but in the seventeenth century, these were replaced by collections of psalms, antiphons and solo motets intended as antiphon substitutes, usually written in the new stile concertato and intended chiefly for Vespers. The best-known example is Monteverdi’s Vespers of 1610, though that is unusual in its careful presentation of music for just one service. The music is in the new style, even the psalms for several voices requiring soloists and demanding a more virtuosic manner. An organ continuo accompaniment is necessary, and sometimes other obbligato instruments too. Masses appeared rarely, and tended to be written in a more traditional manner. Monteverdi must have written considerably more than the three settings of the Mass which have survived. In 1601, when applying for the position as successor to Pallavicino as maestro di cappolla to Vincenzo Gonzaga, Duke of Mantua, he mentions his motets and masses, and in a letter of 1634, he implies that he was expected to write a new Mass every Christmas. In 1631, the thanksgiving for the end of the plague included a solemn mass by Monteverdi, with loud trumpets playing during the Gloria and Credo: the Gloria may perhaps have been the one published ten years later in his massive collection of Venetian service-music Selva morale. But it is significant that his concertato Masses were not published: there was evidently no market for them. Each of the three publications of Monteverdi’s church music begins with a Mass, but they are all in the old a capella style, contrasting with the concertato style that predominates in the rest of the collections. 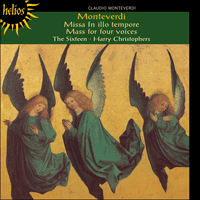 Monteverdi is having printed an a capella Mass for six voices written with much study and toil, since he had to continually manipulate every note through all the parts, always further strengthening the 8 themes from Gombert’s motet In illo tempore. And he is also having printed with it some psalms for the Vespers of the Virgin, with various and diverse manners of invention and harmony, all on a cantus firmus. He intends to come to Rome this autumn to dedicate them to His Holiness. This is a not-too-inaccurate description of the publication which appeared later that year in Venice, dedicated to Pope Paul V. This begins with a ‘Missa da capella a sei voci fatta sopra il motetto In illo tempore del Gomberti’, to quote the fullest version of the title, which heads the organ part. There is no contradiction in having an organ part to a Missa da capella: the term lacked the implications that a capella was later to acquire. There was, however, one place where church music always was sung unaccompanied, the Sistine Chapel in Rome; so it is not surprising that the copy of the Mass surviving there omits the organ part. Monteverdi visited Rome in the autumn of 1610 to present a copy in person, hoping to receive in return a scholarship for his son Francesco (and perhaps some advantage for himself as well). Although the entire publication of Mass and Vespers was dedicated to the Pope, it is likely that only the Mass was in fact presented, since the Vesper music was hardly in accordance with Papal taste: the Vespers were far more suited to Venice, where the edition was published and where the composer soon secured one of the most highly prized positions available, taking charge of the musical forces of the basilica of St Mark. Nicolas Gombert was born in Flanders around 1495, studied with Josquin and spent most of his life as a member of the chapel of the Emperor Charles V. He was sacked for pederasty in 1540 and sentenced to the galleys: he was soon pardoned, but little is known of his subsequent career. He died between 1556 and 1561. There were connections between Gombert and one member of the Gonzaga family, Ferrante, to whom Gombert sent a motet in 1547; the library of the Gonzaga chapel, Santa Barbara, included at least one of Gombert’s published sets of motets. There is no obvious reason why Monteverdi should choose a work by him on which to model his Mass; but he was clearly intent in going back beyond the preceding generation of Italian composers to the Flemish sources of the polyphonic style. Monteverdi self-consciously heads the work with a list of the themes he has extracted from Gombert’s motet (ten of them, in fact), perhaps because he realized that it would be unknown, perhaps to show that he was interested in the abstract treatment of the conventional thematic tags rather than in parodying it as a whole. Six-voice writing was becoming unusual for polyphonic writing: it is symptomatic that Palestrina’s most famous six-voice Mass, the Papae Marcelli, was rewritten after his death for the more fashionable four voices. In the Vesper psalms which completed the 1610 publication, Monteverdi shows impressive skill in writing idiomatically for many voices within the clearer harmonic patterns of the new style. In the Mass, the harmony is still generated from a bass line which is part of the contrapuntal network, though there is a clear sense of tonality. The texture is dense, with few rests for individual parts, and only one section of chordal writing, ‘Et incarnatus est’, which draws attention to the change to E major from the prevailing C major. The following ‘Crucifixus’ restores C major, but uses the highest four voices only. E major is again used for tonal contrast in the ‘Benedictus’. The final ‘Agnus Dei’ is for seven voices, following the tradition of adding an extra voice for the last section of the Mass. In 1620, Giulio Cesare Bianchi issued two anthologies of motets, one in praise of God, the other of the Virgin. The former included four items by Monteverdi, among them Cantate Domino and Domine, ne in furore. The scoring is again for six voices, but the writing is considerably more relaxed and unselfconscious than in the Mass, with homophonic sections and a more integral and madrigalian relationship between word and note. Of the two large collections of Monteverdi’s Venetian church music, the composer was responsible in some degree for the 1641 Selva morale, much of whose contents dated back at least a decade. After his death, the publisher Alessandro Vincenti collected ‘the sacred relics of the works of the most excellent Monteverdi’, beginning his volume with a ‘Messa a 4 voci da Cappella’. The composer shows himself to be particularly concerned with thematic economy, and much of the music is derived from the descending scale of a fourth and the rising thirds of the opening theme. The power of the descending fourth as a ground had been demonstrated in the Lamento della Ninfa; here it is less regular and often disguised. The vocal lines are more florid than in the 1610 Mass and nearer those of Monteverdi’s concertato music; the texture is varied with duets and trios, time changes and chordal passages with strong rhythms. In 1610 Monteverdi was looking backwards; but later in his life (there is no clue when the 1650 Mass was composed, but it is inconceivable that it antedates the 1610 one), he could write in a more uninhibited way, combining the practices of both old and new styles without incongruity, the fruits of his labours on Gombert’s themes being the contrapuntal freedom of this four-voice Mass. Le mélomane curieux de découvrir la plus belle musique religieuse du XVIe siècle se tourne généralement vers les messes de l’époque. Ceci s’explique en partie par le fait que dans notre ère post-symphonique, nous pensons souvent à une messe d’une demi-heure comme étant plus significative qu’un motet de trois minutes. Mais pour le compositeur de l’époque aussi, la messe était un véhicule musical très important par lequel il démontrait son art à grande échelle, faisait honneur à une occasion spéciale ou à un personnage particulier (un saint ou un important mécène), ou rendait hommage à un autre compositeur en choisissant de suivre son modèle et d’appliquer ses thèmes à son œuvre. Vers la fin du siècle, la messe devient toutefois moins importante, notamment parce que la messe reçoit une signification empreinte d’un plus grand respect. Les arguments de la Réforme sur la nature de la messe et la réaction de l’église Catholique dont est témoin le Concile de Trente, diminuent l’utilisation de la messe en tant que démonstration ostentatoire des talents d’un compositeur. Il est important de noter, par exemple, qu’il n’existe aucune messe complète par Giovanni Gabrieli qui écrivait pour l’église la plus célèbre en termes d’élaboration musicale de la messe, St Marc à Venise. Les changements fondamentaux du style musical de cette période s’effectuent ailleurs que dans la messe. Les compositeurs du XVIe siècle publient des livres entiers de messes et de motets, mais au XVIIe siècle, ceux-ci sont remplacés par des collections de psaumes, antiennes et motets, ces derniers destinés à remplacer les antiennes, généralement écrits dans le nouveau stile concertato et destinés aux vêpres; il faut compter parmi les plus connues, les Vêpres de Monteverdi, en 1610, bien que le soin apporté à leur présentation musicale soit inhabituel pour ce seul office. La musique est de style nouveau et même les psaumes pour plusieurs voix font intervenir des solistes et exigent une virtuosité plus importante. Un continuo à l’orgue est nécessaire et parfois d’autres instruments en obbligato sont requis. Les messes font rarement leur apparition et tendent à être composées d’une manière plus traditionnelle. Monteverdi écrit de très nombreuses versions de la messe et non les trois seules ayant survécu. En 1601, il présente à Vincenzo Gonzaga, Duc de Mantoue, sa candidature à la succession de Pallavicino en tant que maître de chapelle, et mentionne ses motets et ses messes; plus tard, dans une lettre de 1634, il implique qu’on attendait de lui qu’il écrivît une nouvelle messe tous les ans pour Noël. En 1631, l’office solennel d’action de grâce pour la fin de la peste inclut une messe solennelle par Monteverdi, dans laquelle des trompettes sonores résonnent dans le Gloria et le Credo: le Gloria est publié environ dix ans plus tard dans l’énorme collection de musique religieuse vénitienne, Selva morale. Mais il est important de noter que les messes concertantes ne sont pas publiées. À cette époque, il n’existe aucun marché pour ces œuvres. Chacune des trois publications de musique religieuse de Monteverdi commence par une messe, mais les trois sont composées dans l’ancien style a cappella, en contraste flagrant avec le style concertant qui prédomine dans le reste des collections. Monteverdi fait imprimer une messe a cappella pour six voix, très étudiée et travaillée car il a dû manipuler chaque note dans toutes les voix, renforçant d’autant les 8 thèmes du motet de Gombert, In illo tempore. Il la fait imprimer avec des psaumes pour les Vêpres de la Vierge aux manières diverses et variées d’invention et d’harmonie, le tout en cantus firmus. Il a l’intention de venir à Rome cet automne pour les dédier à Sa Sainteté. Cette description est en fait assez proche de la publication qui apparaît plus tard cette année-là à Venise, et dédiée au Pape Paul V. Elle commence par une «Missa da cappella a sei voci fatta sopra il motetto In illo tempore del Gomberti» pour citer le titre intégral qui surplombe la partie d’orgue sur la partition originale. Une partie d’orgue dans une Missa da cappella n’est pas forcément contradictoire: à l’époque, l’expression a cappella ne revêtait pas sa signification actuelle. Il était toutefois un endroit où la musique religieuse était toujours chantée sans accompagnement, la Chapelle Sixtine à Rome; il n’est donc pas surprenant de constater que la copie de la messe ayant survécu à Rome omet la partie d’orgue. Monteverdi visite Rome à l’automne de l’an 1610 pour présenter sa messe en personne, espérant ainsi recevoir une bourse d’études pour son fils Francesco (et peut-être aussi quelques avantages personnels). Bien que la publication entière de la Messe et des Vêpres soit dédiée au Pape, seule la Messe aura été présentée au Souverain Pontife car les Vêpres n’étaient pas vraiment du goût papal de l’époque: celles-ci convenaient bien mieux à Venise, ville de publication de l’œuvre, où le compositeur obtient rapidement l’un des postes les plus prestigieux qui soient, directeur musical de la basilique St Marc. Nicolas Gombert naquit dans les Flandres vers 1495, étudia avec Josquin Desprez et passa la majeure partie de sa vie en tant que membre de la chapelle de l’Empereur Charles V. Renvoyé pour pédérastie en 1540 et condamné aux galères, il est rapidement pardonné mais on ne sait rien de la suite de sa carrière. Il meurt entre 1556 et 1561. Il existe une relation entre Gombert et un membre de la famille Gonzaga, Ferrante, à qui le compositeur envoie un motet en 1547; la bibliothèque de la chapelle Ste Barbara des Gonzaga, comprenait au moins l’un des recueils de motets de Gombert. Personne ne sait exactement pourquoi Monteverdi choisit une œuvre de Gombert comme inspiration pour sa messe, mais il avait clairement l’intention de rechercher au-delà de la génération précédente des compositeurs italiens pour aller puiser dans les sources flamandes du style polyphonique. En tête de l’œuvre, Monteverdi place volontairement la liste des thèmes (dix au total) du motet de Gombert, peut-être parce qu’il se rend compte que ce motet est probablement inconnu, ou peut-être pour montrer qu’il s’intéresse au traitement abstrait de la thématique conventionnelle et non au fait de l’imiter dans son ensemble. L’écriture à six voix devenait inhabituelle pour l’écriture polyphonique: la très célèbre messe à six voix de Palestrina, Papae Marcelli, sera réécrite après la mort du compositeur pour les quatre voix plus à la mode. Dans les psaumes des Vêpres qui viennent compléter la publication de 1610, Monteverdi fait preuve d’un talent impressionnant alors qu’il cisèle les multiples voix en motifs harmoniques clairs et limpides du nouveau style. Dans la messe, l’harmonie est toujours générée par la ligne de basse, partie intégrante du contrepoint, alors que s’exprime un sens clair de la tonalité. La texture est dense, avec de rares pauses pour les voix individuelles, et seule une section d’écriture chorale, «Et incarnatus est», attire l’attention sur le changement du do majeur dominant en mi majeur. «Crucifixus» restaure la tonalité de do majeur mais n’utilise que les quatre voix du haut. Le mi majeur est repris pour les contrastes tonals du «Benedictus». L’«Agnus Dei» final est pour sept voix, conformément à la tradition selon laquelle on ajoute une voix à la dernière section de la messe. En 1620, Giulio Cesare Bianchi publiera deux anthologies de motets, l’une à la gloire de Dieu, l’autre en hommage à la Vierge. La première collection inclut quatre morceaux par Monteverdi, dont Cantate Domino et Domine, ne in furore. Encore une fois, ils sont écrits pour six voix, mais l’écriture est beaucoup plus détendue et naturelle que celle de la messe, comporte des sections homophoniques et présente une relation plus intégrale, à la façon d’un madrigal, entre les mots et les notes. Entre les deux plus grandes collections de musique religieuse vénitienne de Monteverdi, le compositeur est responsable, dans une certaine mesure de celle de 1641, Selva morale, dont le contenu remonte en grande partie à dix ans auparavant. Après la mort du compositeur, l’éditeur Alessandro Vincenti recueille les «reliques sacrées des œuvres de l’admirable Monteverdi», et le volume commence par la «Messa a 4 voci da Cappella». Le compositeur montre lui-même une préoccupation particulière pour l’économie thématique, et une grande partie de la musique est tirée de la gamme descendante sur une quarte et des tierces montantes du thème d’ouverture. La force de la quarte comme base de composition est démontrée dans le Lamento della Ninfa; elle est ici moins régulière et souvent déguisée. Les lignes vocales sont plus fleuries que celles de la messe de 1610 et se rapprochent de celles du style concertato de Monteverdi; la texture varie avec des duos et des trios, la mesure change et les passages en accords reçoivent des rythmes puissants. En 1610, Monteverdi regardait vers le passé; mais plus tard dans sa vie (on ne sait pas exactement quand la messe de 1650 a été composée, mais il est inconcevable qu’elle soit antérieure à celle de 1610), il pourra écrire d’une manière moins restrictive, associant les pratiques des styles ancien et nouveau sans incongruité, les fruits de ses labeurs sur les thèmes de Gombert donnant au contrepoint de sa messe à quatre voix une grande liberté. Ein Hörer, der nach dem Feinsten in der Kirchenmusik des 16. Jahrhunderts sucht, wendet sich wahrscheinlich an Vertonungen des Messordinariums. Womöglich liegt das teilweise in der am sinfonischen Zeitalter geschulten Annahme begründet, eine halbstündige Messe sei irgendwie gewichtiger als eine dreiminütige Motette. Nun war die Messe für die Komponisten jener Zeit tatsächlich ein wichtiges Medium. Häufig nutzten sie hier die Gelegenheit, ihre Fähigkeiten im großen Maßstab unter Beweis zu stellen. Messen wurden auch oft für besondere Anlässe oder spezielle Personen (einen Heiligen oder Schutzherren) geschrieben, und manchmal würdigten die Komponisten einen Kollegen, indem sie in freundlicher Verneigung ihre eigene Messe auf Themen des Vorbilds aufbauten. Als sich aber das Jahrhundert dem Ende zuneigte, verlor die Messe in musikalischer Hinsicht zunehmend an Bedeutung. Ein Grund dafür bestand im größeren Respekt gegenüber der Bedeutung der Messe. Ihre neue Wesensbestimmung durch die Reformation und die im Tridentiner Konzil sichtbar werdende Reaktion der katholischen Kirche beschränkte den Einsatz der Messe als eine Gelegenheit für prunkvolle Zurschaustellung. Dass es keine vollständige Messe von Giovanni Gabrieli gibt, ist eine aufschlussreiche Tatsache, schrieb er doch für eine Kirche, die vor allem für die musikalische Gestaltung ihrer Gottesdienste berühmt geworden ist: S. Marco in Venedig. Die grundlegenden Veränderungen im Kompositionsstil dieser Zeit fanden außerhalb der Musik für die Messe statt. Wo Komponisten des 16. Jahrhunderts Bände mit Messen und Motetten veröffentlichten, erschienen im 17. Jahrhundert Sammlungen von Psalmen, Antiphonen und Solomotetten, die anstelle der Antiphonen Einsatz fanden. In der Regel waren sie im neuen Stile concertato komponiert und hauptsächlich für die Vesper gedacht. Das bekannteste Beispiel liefert Monteverdis Vesper von 1610, auch wenn ihre sorgfältige Musikauswahl für nur einen Gottesdienst der damaligen Norm widersprach. Monteverdis Vespermusik steht im neuen Stil. Selbst seine Psalmen für diverse Stimmen erfordern Solisten und eine virtuosere Interpretation. Es gibt zudem eine Generalbassbegleitung für Orgel und manchmal auch für andere Instrumente. Messen jener Zeit erschienen dagegen selten im Druck, und man neigte dazu, sie in einer traditionelleren Art zu komponieren. Monteverdi hat wohl beachtlich mehr als nur die drei uns überlieferten Messen geschrieben. So spricht er zum Beispiel 1601 von seinen Motteten und Messen in seinem an Vincenzo Gonzaga, Herzog von Mantua, gerichteten Bewerbungsschreiben um die nach Pallavicino frei gewordene Stelle des Maestro di cappolia, und in einem Brief von 1634 lässt Monteverdi anklingen, dass man von ihm erwartete, für jedes Weihnachten eine neue Messe zu schreiben. Darüber hinaus gibt es Berichte über eine feierliche Messe Monteverdis zu den Danksagungsfeierlichkeiten für das Ende der Pest 1631. Angeblich erschallten in dieser Messe während des Glorias und Credos laut die Trompeten. Vielleicht ist dieses Gloria genau das, welches zehn Jahre später in Monteverdis riesiger Anthologie venezianischer Kirchenmusik, Selva morale, veröffentlicht wurde. Man kommt an der Tatsache nicht vorbei, dass keine von Monteverdis Messen im Stile concertato im Druck erschien: offensichtlich gab es für sie keinen Markt. Alle drei Veröffentlichungen von Monteverdis Kirchenmusik beginnen zwar mit einer Messe, aber sie sind alle im alten Stylus a capella ecclesiasticus, der gegen den im Rest der Sammlung vorherrschenden Stile concertato deutlich absticht. Für eine Veröffentlichung komponiert Monteverdi gerade eine A-cappella-Messe für sechs Stimmen mit viel Ehrgeiz und Aufwand, da er ständig jede Note durch alle Stimmen manipulieren muss, um immer wieder den 8 Themen aus Gomberts Motette In illo tempore gerecht zu werden. Und dazu lässt er einige Psalmen für die Vesper der Heiligen Jungfrau drucken, mit verschiedenen und diversen Arten von Einfällen und Harmonien, alle über einen Cantus firmus. Er beabsichtigt, in diesem Herbst nach Rom zu kommen, um die Werke Ihrer Heiligkeit zu widmen. Das ist keine vollkommen abwegige Beschreibung der Papst Paul V. gewidmeten Veröffentlichung, die im Verlauf jenes Jahres in Venedig erscheinen sollte. Das erste Werk in der Sammlung ist die „Missa da capella a sei voci fatta sopra il motetto In illo tempore del Gomberti“, wie die längste, in der Orgelstimme verzeichnete Titelversion lautet. Das Vorhandensein einer Orgelstimme steht nicht im Widerspruch zu einer Missa da capella: der Begriff a capella trug damals noch nicht die Bedeutung, die man ihm später zuschrieb. Es gab allerdings einen Ort, an dem man Kirchenmusik tatsächlich immer unbegleitet sang: die Sixtinische Kapelle in Rom. So überrascht es nicht, dass in der dort überlieferten Abschrift der Messe die Orgelstimme fehlt. Monteverdi besuchte Rom im Herbst 1610, um persönlich ein Exemplar jener Messe zu überreichen. Er erhoffte sich dabei ein Stipendium für seinen Sohn Francesco (und vielleicht auch eine gewisse Begünstigung für sich selber). Obwohl die Veröffentlichung als Ganzes, einschließlich Messe und Vesper, dem Papst gewidmet war, kann es gut sein, dass ihm eigentlich nur die Messe überreicht wurde, da die Musik zur Vesper kaum dem Geschmack eines Papsts entsprochen haben dürfte: Vespern passten viel besser zu Venedig, wo Monteverdis Anthologie im Druck erschien und der Komponist sich bald einen der begehrtesten verfügbaren Posten sicherte, als ihm die Leitung des musikalischen Aufgebots der Basilika von S. Marco übertragen wurde. Nicolas Gombert wurden um 1495 in Flandern geboren, studierte bei Josquin Desprez und verbrachte den Großteil seines Lebens als Mitglied der Hofkappelle des Kaisers Karl V. Er wurde 1540 wegen Päderastie entlassen und zum Galeerendienst verurteilt, erhielt aber bald eine Begnadigung. Von seinem weiteren Lebenslauf weiß man allerdings nur wenig. Er starb zwischen 1556 und 1561. Es gibt eine Verbindung zwischen Gombert und Ferrante Gonzaga, einem Mitglied der Gonzaga-Familie, dem Gombert 1547 eine Motette zusandte. Zudem befindet sich in der Bibliothek der Gonzaga-Kappelle Santa Barbara zumindest eine von Gomberts veröffentlichten Motettbänden. Es gibt keinen offensichtlichen Grund, warum sich Monteverdi für ein Werk von Gombert entschied, um darauf seine eigene Messe aufzubauen, aber Monteverdi verfolgte offensichtlich die Absicht, jenseits der unmittelbar vorausgegangenen Generation italienischer Komponisten auf einen polyphonen Stil flämischen Ursprungs zurückzugreifen. Monteverdi listet zu Beginn des Werkes beflissen alle Themen auf, die er aus Gomberts Motette extrahiert hatte (tatsächlich sind es zehn), vielleicht, weil er bemerkte, dass nicht jeder Gomberts Motette kennen konnte, vielleicht um zu zeigen, dass er eher an der abstrakten Behandlung konventioneller thematischer Gedanken als an einer Parodie der gesamten Motette interessiert war. Komponieren für sechs Stimmen wurde zunehmend seltener in der Chorpolyphonie. So ist es zum Beispiel symptomatisch, dass Palestrinas berühmteste Messe, die Missa Papae Marcelli, die ursprünglich für sechs Stimmen war, nach seinem Tod der neuen Mode entsprechend für vier Stimmen umgeschrieben wurde. In Monteverdis Vesperpsalmen, die sich am Ende des 1610 veröffentlichten Bandes befinden, legte der Komponist Rechenschaft für seine beeindruckende Fähigkeit ab, im Rahmen der klareren harmonischen Struktur des neuen Stils idiomatisch für viele Stimmen zu komponieren. Dagegen wurden die Harmonien in der Messe noch immer von der Teil des Kontrapunktgewebes bildenden Basslinie bestimmt, auch wenn es schon ein spürbares Tonalitätsgefühl gibt. Die Polyphonie ist dicht, und es gibt nur wenige Pausen für die einzelnen Stimmen. In der gesamten Messe findet man nur einen homophonen Abschnitt: „Et incarnatus est“. Hier wird die Aufmerksamkeit auf den Übergang vom vorherrschenden C-Dur nach E-Dur gelenkt. Das darauf folgende „Crucifixus“ stellt C-Dur wieder her, nutzt aber nur die oberen vier Stimmen. Als tonaler Kontrast wird E-Dur erneut im „Benedictus“ herangezogen. Das abschließende „Agnus Dei“ ist für sieben Stimmen, womit Monteverdi der Tradition folgt, bei der im letzten Abschnitt der Messe eine zusätzliche Stimme hinzugefügt wird. 1620 brachte Giulio Cesare Bianchi zwei Anthologien mit Motetten heraus, eine zur Lobpreisung Gottes, die andere zur Lobpreisung der Heiligen Jungfrau. Die erstgenannte enthielt vier Werke von Monteverdi, darunter die Motetten Cantate Domino und Domine, ne in furore. Die Besetzung ist wieder sechsstimmig, aber die Kompositionsart ist erheblich entspannter und gelöster als in der Messe. Man findet hier mehrere homophone Abschnitte und eine sich stärker gegenseitig beeinflussende und eher ans Madrigal mahnende Beziehung zwischen Wort und Musik. Von Monteverdis zwei großen Sammlungen venezianischer Kirchenmusik war der Komponist bis zu einem gewissen Grad für die Selva morale von 1641 verantwortlich. Ein Großteil ihres Inhalts war allerdings schon mindestens ein Jahrzehnt zuvor komponiert worden. Nach Monteverdis Tod sammelte der Verleger Alessandro Vincenti „die heiligen Werkreliquien des äußerst exzellenten Monteverdis“. Vincentis Monteverdi-Band begann mit einer Messa a 4 voci da Cappella. Der Komponist ließ hier erkennen, wie stark er sich um thematische Einheit bemühte. Vieles wurde in dieser Messe von der absteigenden Skala innerhalb einer Quarte und von den aufsteigenden Terzen des Anfangsthemas abgeleitet. Die Kraft der absteigenden Quarte als Basso ostinato war schon im Lamento della Ninfa bewiesen worden. In der Messa a 4 voci taucht das Quartmotiv allerdings nicht so regelmäßig auf und wenn, ist es häufig versteckt. Die Gesangslinien sind fließender als in der Messe von 1610 und nähern sich Monteverdis Musik im Stile concertato. Der Stimmsatz wird durch Duette und Trios, Metrenwechsel und Akkordpassagen mit starken Rhythmen variiert. 1610 hatte sich Monteverdi rückwärts gewandt, aber später in seinem Leben (es gibt keinen Anhaltspunkt, wann die 1650 veröffentlichte Messe komponiert wurde, aber es ist undenkbar, dass sie vor der Messe von 1610 entstand) fühlte sich Monteverdi offensichtlich beim Komponieren weniger gehemmt, und er kombinierte ohne Reibungen die Praktiken des alten und neuen Stils. Seine Auseinandersetzung mit Gomberts Themen fand in der Freiheit des Kontrapunkts seiner vierstimmigen Messe ihren Niederschlag.